I had a few metal Destroyer Lord torsos sitting around, and so decided to try my hand at a Cryptek or two. Unfortunately, the chin being tucked in makes it impossible to add the little King Tut beard that makes Crypteks so distinctive. So, the result is that he looks sort of like a dressed-up Deathmark. Hmmm.... maybe if I add a cloak or something. Also, on a semi-related note, I came across these metal Grievous & Magna Guard models. 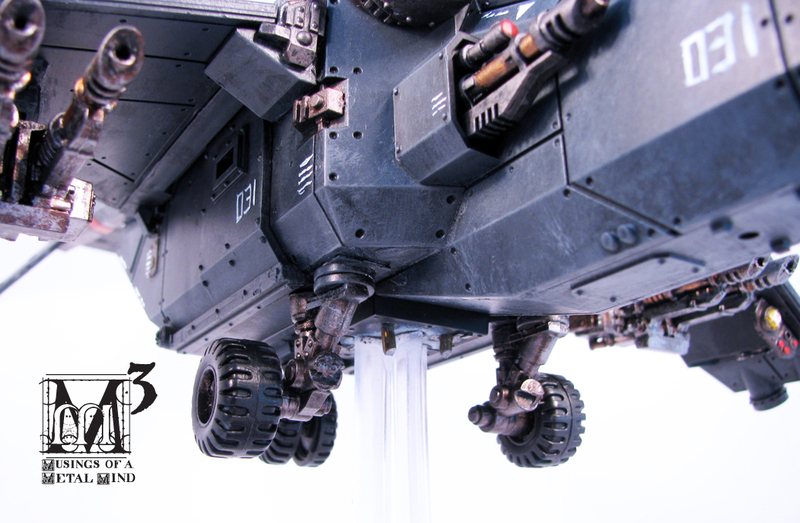 Being made in Europe by a Spanish company called Knight Models, they're nice, but expensive. 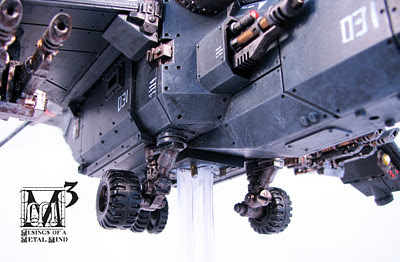 For the money, I'd rather stick with the scratch-built variety, but those are some nice minis, and if they're not officially licensed, it might be worth the hassle to get some before Lucasfilm shuts the company down with a tactical lawyer missile. 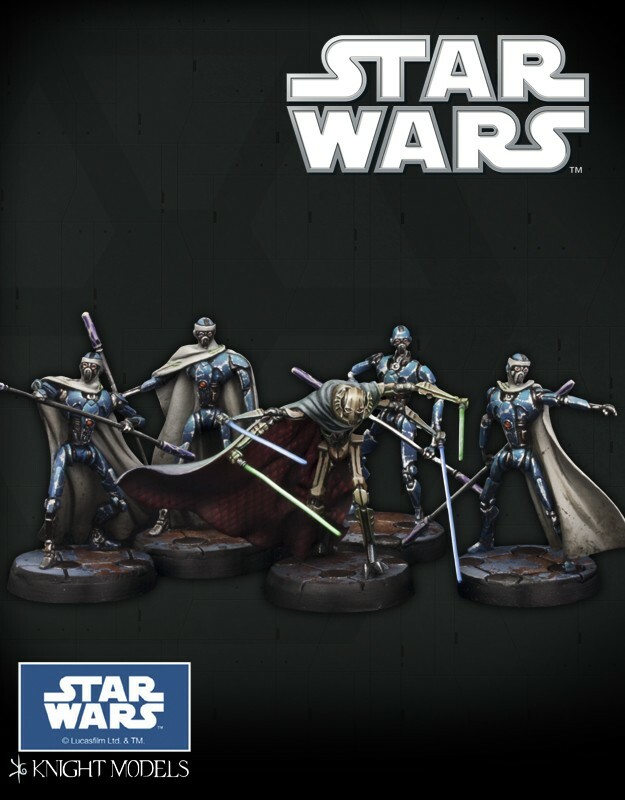 For those interested, they also make a huge variety of other Star Wars minis, too. All of them good sculpts, too. As you can see, the thing can sit on its big, comfy airplane tires in either under-hull or winged configuration, which, for some reason, leaves me immensely satisfied. Now some guy in a tractor can drag the thing around, or a bunch of strong-backed lads can get back there and give her a push, and off she'll go. Sure, I presented all sorts of reasons why putting load-bearing gear on the wingtips is a bad idea, and maybe I'll add another belly gear like the AV-8B, but otherwise, I'm quite pleased with the way it looks. This also visually distinguishes the Vendetta from the old stock Valkyrie by another notch, which is fine by me, because they're different aircraft that do different things (yes, I know, they both carry troops). I thought about adding some aft engine cowling to alter the silhouette a bit like the vehicle carrier version, but at the time I think I was too lazy to go out and buy some plasticard. 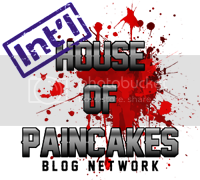 Also, I put watermarks on things now. The reason for all the slow posting lately is that in between all the Necron stuff, I've also been deluged with commissions. Client X and a friend of his got into Warmachine, so some of that stuff came my way in the form of not one, but three of these squad boxes (in addition to some 40k stuff). I gotta say, if (and some say when) I ever dump 40k, the PP folks might be pulling in some of the money from my eBay sales. 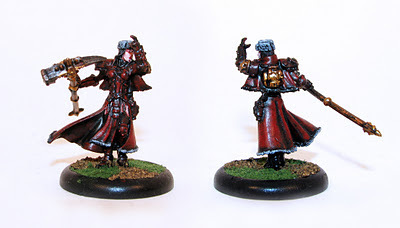 At this stage, if I had to pick a faction, it'd be Khador, too. Heavy armor, big guns, axes and Russian babes? Man, these people have my number. I have this lady in metal, and I must say, I'd rather have metal character minis than plastic any day. While the plast that PP is using holds detail well, in this small size it seems rather, well... flimsy. I'd fear for her outstretched right arm and that long war pick in the long run. On the plus side, there is a certain amount of elasticity to this stuff, so the figures may prove to be quite hardy. They certainly glue securely, and quickly; there were no "is it or isn't it?" moments like you'd expect to have for bonding pewter components. When you look at a few of them all standing in the same place, yes, Warjacks all look the same. 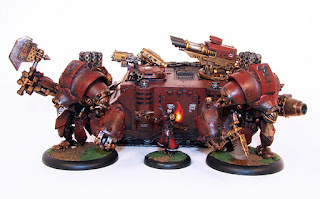 On the one hand, there's definitely something to be said for adhering to a design aesthetic; there's no mistaking a Warjack for a Dreadnought, or a Votoms, or a Battlemech or anything else. Realistically, of course, those tiny legs and hips could never support that enormous orb of a torso, but oh well. I did my best to re-pose this thing and its brother from their static setup to something more dynamic, and found the hip joints to be agreeable pliable without snapping clear, which, again, is a plus of this grade of plastic. I'm all for big cannons. I am. However, the muzzle on that Destroyer is just to big and chummy to be believed. look at that thing; it's like the drum of a cement mixer or something! There's something to be said for layered plates of heavy armor, which is a look the Warmachine artists pull off admirably, but come ON. There was a Razorback kit to do, too, and since I was working in red, it went rather quickly. WM players, take note: if you're looking to switch into 40k, your warjacks would make excellent Dreadnaughts, so save yourself some cash. 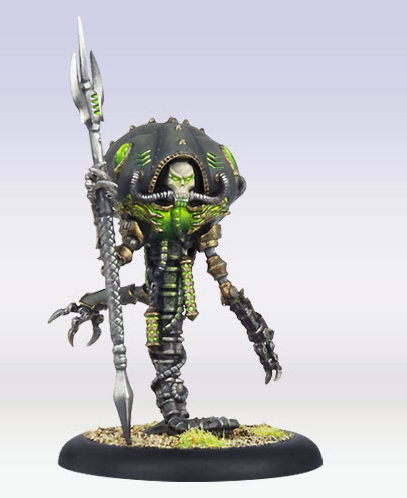 Still to come: Dark Eldar, more Warmachine, a mk2 Vendetta, and a magnetized Ghost/Doomsday Ark. 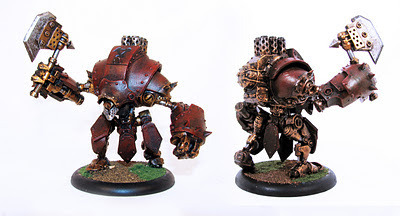 Whether it's their Wraith engine or this thing, every time I turn around Privateer Press turns out something cool. Between this and their stompy Warjack goodness, it's almost as if they want me to try their game or something. 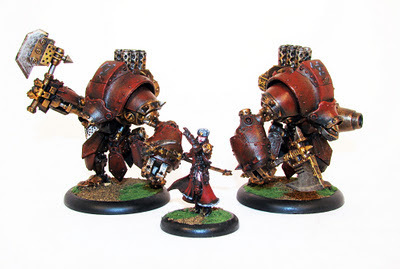 Maybe if I sell a WHF army or two? 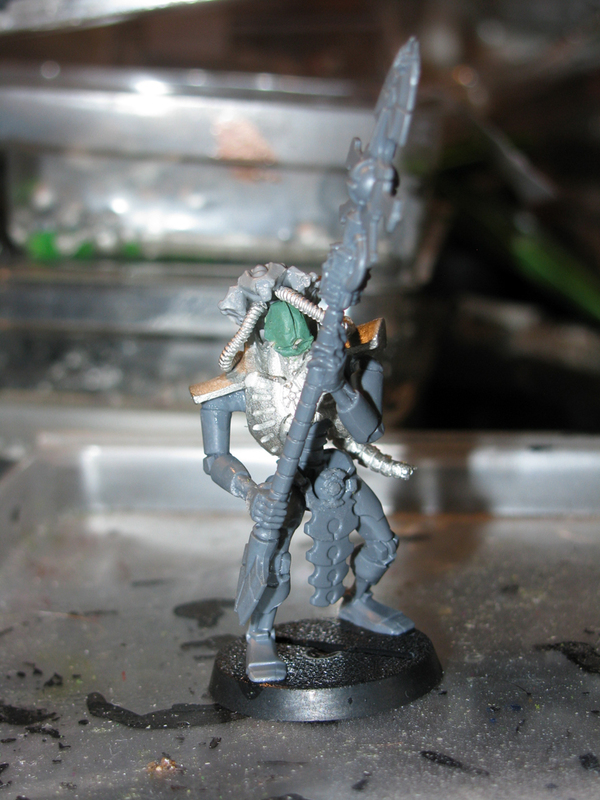 If I hadn't already made a Zoanthrope model, this thing would be it. Maybe Skullball will be my new Overlord or something, I dunno. Either way, I want one.